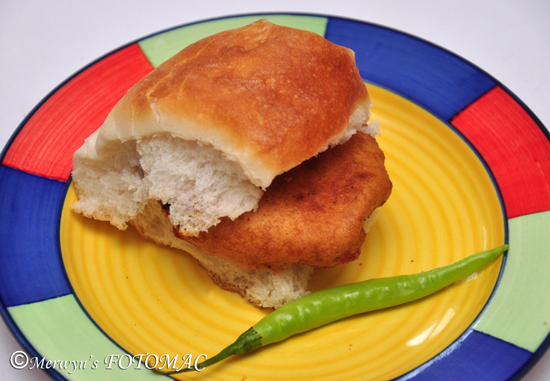 Vada Pav is the most famous Maharashtrian street food. I have many fond memories of batata vada & vada pav. I used to enjoy it in my school & college canteen, at the movies, whenever I was hungry. I can never ever forget the batata vadas of “Karjat.” Whenever I travelled by train to Mumbai the aroma of fresh hot batata vadas would beckon me when the train stopped at Karjat. Vendors with cane baskets filled with vadas would serve it on a banana leaf with tasty chutney. The batata vadas of “Lonavla” are so delicious. Whenever we go on a drive to Lonavla to visit friends or on a picnic & to enjoy the rains & waterfalls of Lonavla-Khandala, we thoroughly enjoy the hot vadas.. they are so irresistible! The vadas at “Mandai” in Pune are so inviting.. they are prepared by home makers who put up make shift stalls in the early mornings only for breakfast. Wash & boil potatoes in their jackets with sufficient water either in a pot or pressure cooker till tender with a little salt. (I used a pressure cooker). To pressure cook use about 4 cups of water & about 4 whistles. Do not over cook the potatoes. Cool the potatoes & peel off the skin. Lightly mash the potatoes & keep aside. Heat a tempering pan or a small pan with 1 tbsp. vegetable oil till hot & add cumin seeds, mustard seeds, curry leaves, turmeric, asafoetida, sugar, grated ginger, garlic & green chilli paste. Stir for about a minute & set aside. In a sufficiently large bowl, mix together mashed potatoes, the tempered masala, chopped coriander leaves & salt to taste. Knead to form a well mixed potato dough. Take lemon sized portions of the dough & form a vada/patty which is slightly flattened. Place the prepared vadas on a plate. In a bowl, mix together besan, red chilli pwd., turmeric pwd., baking soda, ajwain & salt. Add ½ cup water & mix well to form a smooth paste. Use a balloon whisk preferably to mix. Make sure there are no lumps. The batter should be slightly thick; it should coat the back of a spoon & should be of dipping consistency. If the batter is too thick then it may remain uncooked & if it is too thin then the vadas will not get an uniform coat & may burn easily. Set aside the batter to rest for about 15 mins. Meanwhile, heat vegetable oil in a wok/kadhai/deep pan till hot. 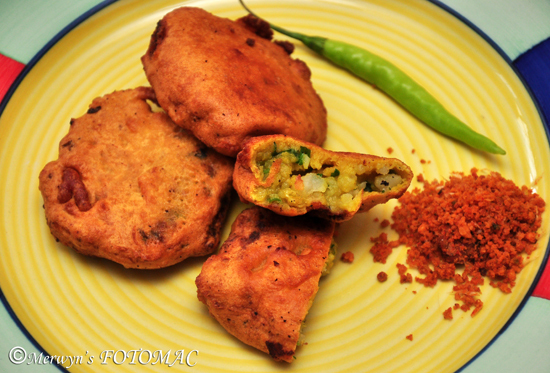 Mix the batter once again & dip each vada/patty in the batter & gently lower it in the hot oil. Gently & carefully baste the top of the vada with hot oil from the kadhai using a slotted spoon. You will see the top sizzling with a slight fried coat. Fry both sides of the vada till well cooked & lightly golden & crisp. Flip the vadas occasionally to fry evenly. It may take about 2 mins. of frying on each side. Adjust the flame if it is too much. Fry few vadas at a time to maintain the temperature of the oil & to avoid soggy vadas. Leave sufficient space for the vadas to fry or they will stick together. Lift the vadas with a slotted spoon. Drain the oil completely & transfer to a plate lined with tissue paper to absorb excess oil. Serve hot with spicy green chutney/ dry garlic chutney, ketchup or sweet date & tamarind chutney. Laadi Pav are small square shaped, soft white bread rolls which are baked & are available in local bakeries in the neighbourhood. The pav is arranged in slabs or “laadi” in rows of 3-4 pav or bread merged together. The big pav are 6 merged together & the regular size is 8 pav merged together. Generally they are sold in plastic polythene bags, unlabelled as they arrive directly from any local bakery. Some bakeries also sell whole wheat laadi pav which is a healthier option. Separate one pav from the laadi (laadi means slab). Slice each pav into half without separating into two halves. (You may even use your hands to half as the bread is very soft). Apply some dry garlic chutney or some spicy green chutney if you want it really very hot & spicy. Spread some sweet date tamarind chutney on both the halves. You may even use any one chutney or any combination, the way you like it. Place one hot batata vada in between the pav & serve immediately.